Knowsley Council is seeking views on its plans for East of Halewood – an exciting new residential development of high-quality housing in a semi-rural setting. The site is strategically located and has established transport networks by road, rail and public transport for travelling to and from cities such as Liverpool and Manchester and is only a 15 minute drive from Liverpool John Lennon Airport for international connections. The second largest residential development site in Knowsley, East of Halewood extends to just over 80 hectares. To help guide the development of up to 1,500 high quality new homes, Knowsley Council has worked with its partners to develop a masterplan for the site. Major national house builders, Redrow, Bellway and Miller Homes are working with landowners to bring forward the development of this new housing community. The site is also home to the Grade II listed grave of Blackie the war horse, which will be preserved and enhanced as part of the development. This is your opportunity to provide any comments on the draft East of Halewood Supplementary Planning Document and draft East of Halewood masterplan, which can be viewed on www.knowsley.gov.uk/consultations. The closing date for feedback is Wednesday, 10 April 2019. The Town Council has a vacancy for a Senior Administrator. Information about the post and details of how to apply are shown in the following documents. Below are some funding streams that they may be of interest for community groups etc. In line with best practice, the Returning Officer will be holding a Candidate and Agent’s Briefing with regard to the forthcoming elections. As the sessions will be taking place when the building is closed to visitors and taking room capacity into account, we would request that anyone wishing to attend please email cheryl.ryder@knowsley.gov.uk with the date they wish to attend. Members of Halewood Town Council were delighted to welcome to last nights Town Council meeting the Police and Crime Commissioner for Merseyside Jane Kennedy and Supt. Clare Jenkins from Merseyside Police. 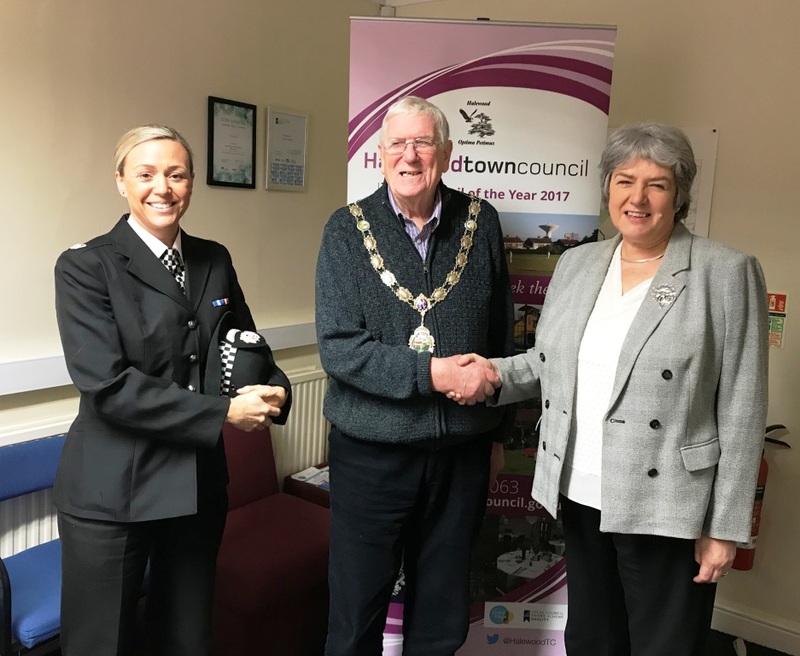 Cllr Hogg, Chairperson of the Town Council and Mayor of Halewood, welcomed them to the Arncliffe Centre and during their presentation to the Council, confirmed the welcome news that Halewood Police Station is to undergo a major refurbishment in advance of its secure future serving our Town. Details of the announcement can be found in the attached press statement form the Commissioner’s Office released today. Here’s the link to the agenda for this months meeting. The Police & Crime commissioner for Merseyside is undertaking a consultation on the finances required to recruit additional Police Officers for Merseyside. Details are shown at the link below and residents are encouraged to take part in the consultation if at all possible. Arncliffe Sports and Community Centre, Arncliffe Road, Halewood L25 9PA. The vehicle driven onto and burnt out on Doorstep Green last night, has been reported to Police and as soon as they give permission for its removal, we will make arrangements for it to be taken away.